Here at American Garage Door and Gate Systems, we are committed to serving Denver homeowners and businesses. That’s why we’ve been offering quality service and products since 1974! One of the reasons that our customers love our work so much is that we always use quality products that we’re proud to stand behind. Today we’d like to talk about Wayne Dalton commercial garage doors, types and styles offered. Remember these are just some of the great product options that we offer. First, let’s look at the three types of commercial sectional doors offered by Wayne Dalton. Aluminum: These doors can be ordered with glass windows and are perfect if visibility and light transmission are important. They’re also weather resistant and require minimal maintenance. Steel: These top of the line doors come in a variety of styles and are a great choice when thermal insulation and R-value rating is a top priority. Non-insulated Steel: This option has all the strength of steel but at a more economical price. 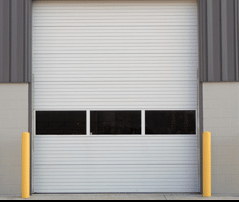 When it comes to Wayne Dalton commercial garage doors, types and styles, their rolling door selection is pretty impressive and offers options for a number of industries and uses. Security Grilles: If you don’t need a solid door but want protection against break-ins, grille doors provide real security. Constructed using aluminum, or in combination with steel and stainless. Fire Doors: Take your pick of steel, stainless steel, and galvanized steel. No matter what, you are sure to find the right door for your fire insulation needs. Counter Shutters: Whether you need one for your interior or exterior, there are beautiful wood or steel options to protect your counter. Roll-Up Sheet Doors: These specially designed doors are for the self-storage industry. There are options available for exteriors as well as a line of specifically designed doors for climate controlled interiors in a self-storage building. Advanced Systems: These entries focus on security and low maintenance, made in insulated or uninsulated varieties. Security Shutters: Wayne Dalton makes installing security shutters a breeze with a broad range of sizes and styles. These are great for hospitals, pharmacies, schools, offices and retail spaces. High-Speed Doors: These impressive doors are designed for speed and efficiency and most open in four seconds or less. With their patent pending designs and safety features, these doors are perfect when speed is critical. Of course, this is just a quick overview of the products that Wayne Dalton builds and just one of the companies that American Garage Door and Gate Systems works with. We actually use many sources to provide the best solutions and offer Denver businesses the widest range of top products. As always, if you have any questions about the products that we carry, give American Garage Door and Gate Systems a call and one of our friendly professionals will be happy to provide more information on Wayne Dalton commercial garage doors, types, and styles. Contact us today for a consult and estimate!